I thought I'd present a tutorial on some character artwork I did recently. This is not really a tutorial showing off any particular effect or trick (in fact, I use very few "tricks" at all), but rather a way for you to get an insight in how I go about creating a moderately complex image in GIMP. There are also some layout, sketching and composition ideas to be had along the way. I myself love to see how others work and think, because it's usually very different from person to person. Hopefully this will help you too -- or at least give you some ideas. 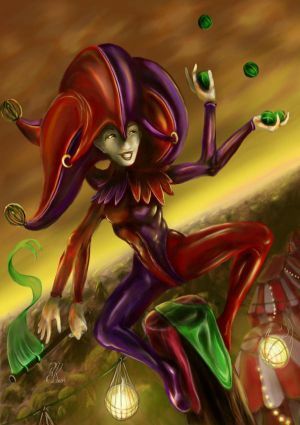 The character is a rather humorous character from a fantasy RPG known only as "The Jester". She is human except her arms split below her elbows leaving her with four hands. And that's about all the info you need on her for the sake of this tutorial. All thumbnails below are clickable. Enjoy! I run GIMP 2.2.13 (i.e. stable) under Linux Debian on a 3GHz machine, using an (aging) Radeon 9800Pro graphics card. The reason the screen is so wide is because I have it stretched over two monitors, one Sony Trinitron 20" (superior colour depth) to the left, and a flatscreen Viewsonic 19" to the right. GIMP works nicely with the control windows on the right Viewsonic monitor whereas the image resides alone on the Sony. I use a Wacom tablet for input. Works like a charm in GIMP and if you don't have one I can not recommend it enough. No scanning was used at any time during the making of this image. Total work time about six hours. In GIMP I've found it it's useful to leave the canvas ("background") alone and do all sketching on a layer above it. (Ignore the "new layer" thing in this image, I just created it because I forgot to snapshot the very first sketch I did. I work on "Sketch" all the time). The initial sketch is seen on the left . The canvas is an A4 at 300dpi. It's done, as is most work in this image, with the airbrush tool and an opacity set to 50%. I set my brush to be adaptable, so it will it'll resize gradually upwards and downwards at the press of a button. This is a very useful setup, allowing swift changes of brush work. Note that the sketch is done at a large zoom-out, to allow large sweeping strokes across the image. I really do most of the work at this zoom, to get the overall composition right. Not until much later do I zoom in. This is not really a tutorial on anatomy, but for the character sketch, the most important line is the spinal line, since it establishes the form of the entire figure. Once the spine is in place, the legs and arms follows. I lay out most of the pose with only this stick-figure. Much easier to erase only one line if things look weird. There is no point to go close when drawing large things covering the entire image, so I keep working at zoom-out mode. Now I start "tubing" the stick-figure, placing cylinders over the lines and connecting them with ball-joints. Then I flesh out those cyliners to sculpt the actual form. Tricky stuff like shoulders and hips in perspective is much easier to get right this way. The Jester has a slim, well-trained body with a narrow chest, so I tried to accomodate that. I also wanted to show that she's rather short, so her legs are "realistically" long, rather than the super-hero length of legs which are usually drawn atlmost a foot longer than most realistic humans could ever hope for. The head, which is about the same size regardless of your overall length, is therefore proportionally larger to the body. Arms would have been a nightmare if I hadn't alredy tried out the stick-figure, but nevertheless the right arm changed because I didn't want her to block her own body with her arms. Also note the protruding rib-cage under her right breast, this is an effect of her pose and slim form. Cleaned up the sketch. Note that this sketch is done on the original size of the image, so the lines are really thick! This is of little importance, since we will remove all sketch layers before the image is done. Finally, I rescale the layer to better place the Jester on the page and have less empty room at the edges. I created a new layer (background #1) behind the Jester where I sketched the wooden pole she sits on. On this layer I also put the stuff she's doing with her hands (note: The wrong layer is selected in this image. Sorry about that). The initial sketching is now done. Note that I wait with the face until later, simply because of how it's done (we'll get back to that). Before we do anything more, we have to establish the background and colouring. So behind the sketch layers we create a new one. This "background #2" layer is the first one we have created that will remain in the final image. Lower the opacity of the sketch layers so the new background can be clearly seen through them. I want dynamics in the image and one way to create dynamics is by diagonals. Diagonals give the eye things to do, makes an image less static. So with the select lasso tool I sweep out a diagonal bottom half of the image. This is the horizon of the image. I fill it with a standard shade roughly with the same colour scheme and structure I want. An important thing to think about is not to create unnessecary parallel surfaces. If I wasn't careful, the horizon might have been placed lower and could have melded with the top line of her legs for example. Instead I take care to have it cross perpendicular to her midriff. Avoiding blending parallel surfaces is very important in all forms of image composition, this is only one example. I invert the selection and fill the other half of the image. This is the first time I decide that this will be a twilight/evening scene. That choice will influence the entire image from now on. I hide the Jester now, concentrating on the background only. I only look at the Jester image to make sure I place the tents where there are no critical parallel lines blending with her. I also decide to use the shade created by the stock gradient as a basis for the forest edge. It also creates a natural perspective. I kept the gradients untouched on its own layer, doing the details on a new llayer (I'll show the layer structure later). The reason for this is that I could theorethically want to change the colour of the image, and then changing the gradients will affect the colours much more subtly than if I changed the colour of the entire background. The tree outlines are not really sketches, they are to be the first lines of colouring the forest. Borrowing from the gradient colour, I give volume to the trees and have light shine past them into the glade with the tents. The sky of course has to influence them as well, so I add yellow to them, of exactly the same colour as the sky. The forest looked kinda bland, so I also put some other types of trees in there, I also broke up the straight tree-line to make it look less synthetic. I love contrasts in an image, so the tents must of course stand apart from the trees by being red (also a classical tent colour). The sky. This must be done on a separate layer from the gradient, or you'll be in pain when you want to erase something -- you'll never be able to replicate the smooth transition of that yellow gradient! A trick for making easy clouds is to draw them in the same colour as one part ofthe sky. Here I picked the orange in the middle part of the sky. So all clouds are actually done with exactly the same colour -- contrast does the rest. This is a very simplistic sky -- all clouds are on the same level and they don't overlap at all. I felt it best not to make the sky too messy, with the ground having so many details already. The only thing to think of is to make the clouds thinner near the horizon, to create the illusion of them being more distant. Working over the image with smaller brushes, I created more structure to the trees and added more details. I added some highlights in the clouds, but kept it to a minimum for said reasons. I also blurred the horizon a bit, adding some white. This simulates the distance-haze you see when looking through a lot of air. The background is done. Now for the foreground! This is the current structure. ( "Background #1" was the sketch of the wooden pole if you forgot. ), including the clouds and tree layers on top of the gradients called "Bkg colour base". We want to fade the background so we can work on the foreground wthout being disturbed by it. One shortcoming of GIMP is that there is no easy way to reduce opacity on a bunch of layers at a time, nor can you "nest" layers (not that I've found anyway). An easy way to solve this is to put a "white fader plate" between the foreground and background. This is just a layer I've filled with a solid white. Settting opacity will then fade all "below" it. This intermediate layer is coincidentally useful for many other things too, since sitting where it is, it controls the relationship between foreground and background. So we will get back to this "plate" later. This is the result of the white plate layer. Now we can begin with colouring the foreground. Remember that the sketch layers will be thrown away later, so all colouring is done on layers above the sketch. So I lay down the colours of the pole and the lanterns. I chose bright colours to differentiate the elements of the picture. The lanterns are simply yellow spheres that has been clothed with wires to make them look 3-dimensional. So this is how the system is set up right now. I have two foreground colouring layers, one for the Jester and one for the pole. Below lies the fader plate and the background. I pulled out an older image I've done of the Jester at this point, for reference. Must make sure she's the same person! On the colour layer, I lay down the basic colours of the Jester. This is plain blocking it in inside the black lines of the sketch. The sketch is still there, but I've reduced the opacity of it so the thick black lines won't disturb the image. At this point I replicate the lines of the sketch again -- but with colour. Using alternatively dark and bright shades of red and purple I try to convey the shinyness of her dress. Since the dress is so tight, there is some muscular structure that has to be taken into account. Sometime after this, I just delete the sketch layers alltogether. The Jester is an adult woman, so her face must have adult proportions. I've found it helps sketching a lot to lay down a shadow structure like this first, before sketching the face itself. Especially the postiion of the eyes relative the nose and mouth is much easier to see if first seeing the rough shadows like this. On top of the shadows I sketch the eyes, nose and mouth. The Jester has a high-contrast face with mascara, lip-stick and all. She's also glad and happy most of the time, making it fitting to give her an open mouth. Some tweaking later, the main structure of the face is done. I experimented with various ways of incoorporating her teeth before choosing this one. Teeth are always a problem since it's easy to make it look like she's either a snarling animal or someone with a tooth prostheis. Added ears too, since well ... they should be there. Jumping ahead of myself here. This is actually the final image, after a lot of changes in the colouring. But I felt it fit better here, to compare with the previous image. This shows what effect self-shadowing has on a face. It's a bit scary to start putting shadows on something like a face -- something you've put a lot of time into. But it's nessecary for blending it into the image-- and the end result reflects that. Back to the current status of the image, still with the first version of the completed face. Here I've put in the juggling balls and the flag she waves around. Note the choice of colours ; the greens create a rough diagonal (or maybe a curve) from the flag to the pole and up to the balls, broken by the other idiagonal which is made out of the Jester herself, in red an purple. As said, diagonals are useful, bot geometrically and in colours like this. Also did the golden details on her outit, leaving highlights until later. And that concludes the main colouring of the Jester. Now it's time to actually start matching the background to the foreground; make this into one single image. That white "plate" we put in earlier now comes to use. In the same way as the forest fades to white in the distance, so do all tjhings in the background. So we set the plate to a low but non-zero opacity. This will neatly bring forth the background with a slightly different "tint" than the foreground (actually, I also changed the colour ot the plate to a bright white-yellow before being satistfied)). ... and this is the result. The background can be seen, but it's subtly tinted to set it apart from the foreground. It's seen best in the closest tent. The problem is that the Jester don't fit with the colour scheme of the background. The highlights on her dress are white for example. Why should then be white if most light hitting her is yellowish? She clearly needs to be matched to the background. tweaked. I use this to change white into a warmer yellowish hue. This affects the entire foreground and makes it look like she's lit up by the sky. From here on, this tutorial turns a little more sketchy, since I didn't want to focus on shading techniques. Working on yet another layer I add heavy shadowing to the figure at this point. She is after all seen against a bright background. As said, I won't go into detail on how I do shadowing in this tutorial, but it's very important for the final result. Eventually we arrive at the final result, where the character has been shaded and highlighted to fit into the background. Of note, there is a vast difference in the quality of this image depending on what monitor I look at. On my 20" Trinitron (much better colour depth), the picure takes place in twilight, with warm colours, whereas on the flatscreen it looks much brighter and less moody.